Historic draft from the City of New York issued in 1827. 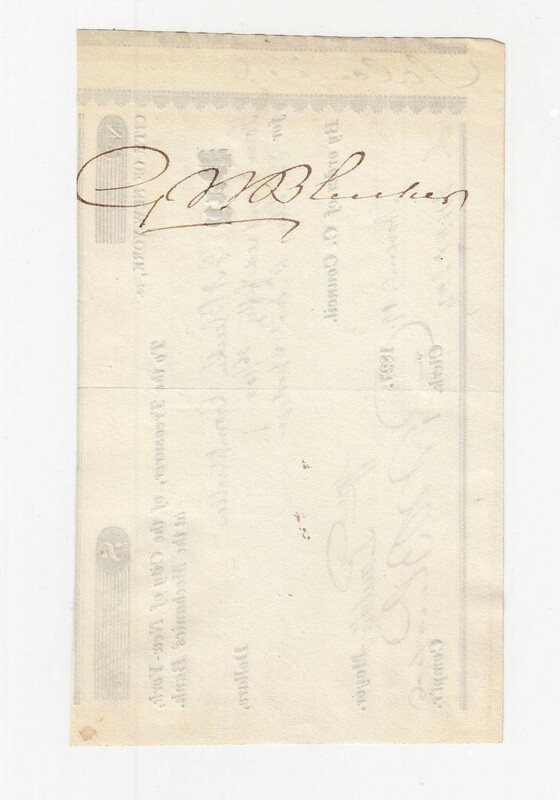 This item has the signatures of the the Mayor of New York, William Paulding Jr. Clerk Jacob Morton and Comptroller, G. N. Bleecker (Garret Noel Bleecker,). It is also endorsed on the back by Garret N. Bleecker. Family is the namesake for Bleecker Street in lower Manhattan. he Buttonwood Agreement, which took place on May 17, 1792, started the New York Stock & Exchange Board now called the New York Stock Exchange. This agreement was signed by 24 stockbrokers outside of 68 Wall Street New York under a buttonwood tree. The organization drafted its constitution on March 8, 1817, and named itself the "New York Stock & Exchange Board". In 1863, this name was shortened to its modern form, the "New York Stock Exchange". One of the 24 brokers who signed the agreement was G. N. Bleecker � 21 Broad Street. He studied law at The College of New Jersey, the predecessor of Princeton University. Morton never practiced law. Morton was the marshal for the First inauguration of George Washington. When it was found that no bible was available, Morton retrieved the Lodge Bible from St. John's Lodge where he was the Worshipful Master. Morton served as New York City Comptroller from 1807 to 1808. 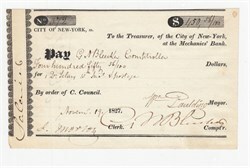 Morton was also later clerk for the New York City Common Council. Morton was an active Freemason, and was the Grand Master of Grand Lodge of New York from 1801�04. The Grand Lodge of New York established an award named for Morton known as the Jacob Morton Award, given to Masons or Masonic Organizations that have demonstrated exceptional voluntary service to their community. Morton as promoted to brigadier-general in 1804. The Brigade he commanded was known as "Morton's Brigade of Artillery," which was the precursor for the Seventh Regiment of New York. As Major-General, Morton led the New York Militia during the War of 1812.